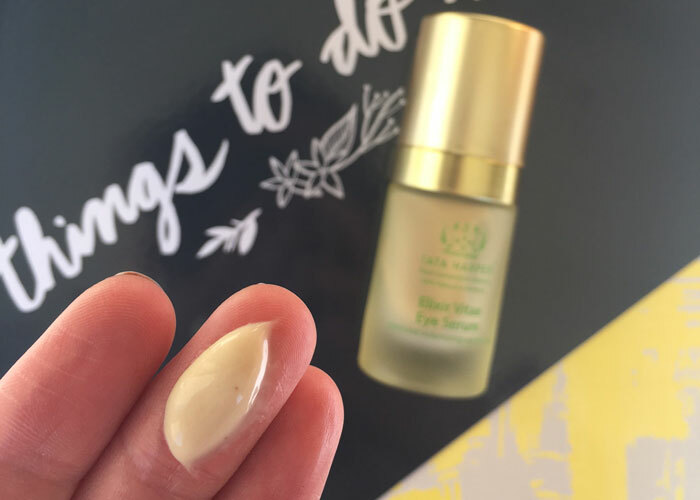 Filled to the brim with plant extracts and peptides, Tata Harper Elixir Vitae Eye Serum promises to minimize the look of fine lines and brighten the eye area. Part of Tata Harper’s “Supernatural Collection,” the line’s self-described most-advanced collection of natural skincare treatments, Elixir Vitae Eye Serum blurs fine lines and wrinkles thanks to acmella extract, which is considered a natural alternative to Botox. That had me applying Elixir Vitae Eye Serum not only around my eyes, but also right in between my brows. And a little around my mouth. And maybe some on my neck. Tata gives her blessing to use Elixir Vitae Eye Serum in this way, saying it’s effective as a targeted line treatment. This is cheaper (and safer) than Botox, right? While I don’t exactly have lines to cover or fill at this point, a little natural prevention doesn’t hurt. Except when it comes to the price. Tata Harper’s Elixir Vitae Eye Serum carries a $265 price tag. The half-ounce bottle will last you a while, even with twice daily use, as you only need about half a pump to cover both eyes. If you use it on additional areas, you’ll of course run through it quicker; just watch it with the dosing. This stuff is ultra-concentrated, and you really don’t need much because it’s so easily spreadable. Viniferin: Polyphenol that helps reduce the appearance of existing fine lines and wrinkles. Another thing to consider with Elixir Vitae Eye Serum is with that ultra-concentrated, plant-packed ingredients list comes a scent. It’s strong and very floral (think iris, lavender and daffodil). If you have sensitive skin or are prone to irritation, you’ll definitely want to sample and test before dotting all over your face. I’ve had zero irritation with this serum, but the scent could definitely use a little taming — and this is coming from a floral junkie. Thankfully, it dissipates rather quickly, and you’re left with plump, soft skin that’s noticeably brighter. That’s the main benefit I found from Elixir Vitae Eye Serum — brightening. To get that brightening, you’ll have to be diligent about consistent application. I noticed it after just three weeks of use. It was easy to stay on the testing train because Elixir Vitae Eye Serum’s texture is absolutely perfect. It’s a thicker serum compared to true, watery serums, but it’s not quite as dense as a cream. This makes the formula feel light yet substantial, as the serum melts into the skin and becomes more fluid. While this dreamy texture has me using Elixir Vitae Eye Serum regularly, I may be rationing out the last few pumps as I decide whether or not I can afford it’s a repurchase. It would definitely get a hard, second look if the fragrance factor was toned down just a notch. If we can move beyond the prohibitive price, it’s inspiring to consider the technology in the formula — on point for what green, luxury beauty needs. It’s still common for people to assume that natural beauty products are just DIY concoctions with little to no science or advanced technology behind them. Tata Harper is absolutely changing that conversation, and that, to me, is priceless. Have you tried anything from Tata Harper? What are your biggest concerns when it comes to the eye area? How important are peptides and skincare technology to you? Tell me in the comments!